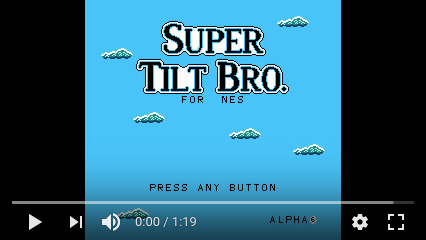 nesdev.com • View topic - Progress Thread - Super Tilt Bro. Post subject: Progress Thread - Super Tilt Bro. Here is my entry: Super Tilt Bro. This is a demake of the Super Smash Bros. series aiming to offer the accessible, yet rewarding to master, "versus platformer" gameplay. All this, adapted to the little NES gamepad. I'll attach the ROM to this thread. 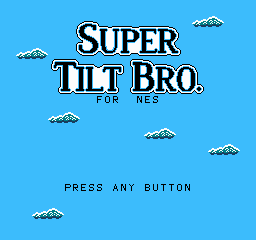 Now and after the compo, the latest ROM version is available on the Super Tilt Bro. page on itch.io. Last edited by RogerBidon on Tue Feb 21, 2017 1:29 pm, edited 5 times in total. I progressed more than expected and already done more than my goal for the compo. Fix the bug causing characters to get stuck between the stage and the bottom blast line. I'd like to discuss the animation flipping. It seems trivial at first, just set the sprite attribute to flip horizontally and, maybe, move a little the sprites themselves. While not a lot more hard, it was interesting to realize that the main character is actually a 3D model made of voxels! All this to make a stupid point: our favourite PPU is a 3D voxel engine! Anyway, it may be actually useful to simulate 3D by taking inspiration on techniques like this one. I appreciate the detail to differences in horizontal flipping. It's more detail than Midway ever had with Kano's sprites. 3. Character holding the weapon with his correct hand in both directions. Most commercial developers won't even care about this(until the 3-D era, when this sorta becomes irrelevant), with some exceptions(such as Enix/Chunsoft with the DQ games, AFAIK at least the party characters' sprites are different facing different directions, and Sega with the original Phantasy Star, but this is more due to the limitation of the system, as the SMS doesn't have sprite flipping capability, you either need to store sprites facing both directions anyway, or have to do this in software, and curiously because it could flip background tiles in hardware, NPCs drawn on the bg plane look VERY symmetric). One particular offender is Street Fighter II, in which they tried a lot in making the characters as symmetric as they could(mainly on the text on the costumes), but still, apart from characters changing between left- and right-handed frequently, there are many aspects that don't look right, such as the US flag on Guile's shoulder, the scar on Sagat's body and his eyepatch(!). Unfortunately, overlapping sprites may become less practical when there are more stuff on screen, like for example, if it ever happens that this game would one day supports 4 simultaneous players (yeah I am dreaming)! In that case, not only will flickering occur more often, but you'll run out of sub-palettes for use with the weapon. Gilbert, I am impressed. You are just so right with your list of advantages! And also the history of flipped chars in video games. Do you have a particular interest on the topic? And yeah, 4 players was never envisioned, so each character can use two palettes and align 4 sprites on a scanline (I hate flickering). Also, the screen-freeze when a hit connects can be disturbing for a player not in the action. So 4 players support would be somewhat of a challenge. More I think of it, more it seems cool, getting this feel of party game of SuperSmashBros. I'll definitely put it on my wet-dream-todo-list with "adding a second character." A little more progress on this. I think it is almost ready to be submitted. Most of it is not big code, but have an incredible impact on gameplay. Even knowing it, it is surprising how all (almost invisible) little things are important in the original game design. Example: while sharing major properties with Super Smash Bros shield, my shield is trash. It misses a little stun of some frames when removed. It makes it completely overpowered (in the good hands) because a player that uses the shield for nothing is not punishable while hyper safe. Without that little stun, a player under shield can just wait for the other to come strike him, then punish that. It is frightening. I saw this game design weakness, but how many do I missed? Changed the version info on title screen: the official name of this version is "nesdev2016"
I added a simple AI as a post-entry enhancement. Edit: removed the attchment, it was not the intended build. Se below for the good one. Last edited by RogerBidon on Mon Apr 03, 2017 8:04 am, edited 1 time in total. Post subject: Re: Progress Thread - Super Tilt Bro. I realized I never commented on this entry before - I really thought I had. It seemed like a really fun idea that I'd really like to see expand. The engine itself felt pretty nice. - a few more characters, or even the same ones with different palettes would have helped. Getting into the gameplay felt really abrupt, and it felt weird to not be able to customize much. 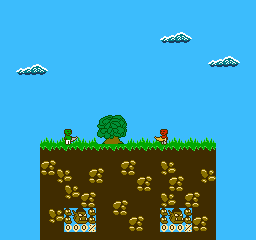 - Platforms in the level would be nice (like gauauu suggested) - especially if you could get them to move or something. I think making the level more dynamic would be a pretty huge win. It might sound odd, but I think it would have felt more polished if there had been character/level selection screens, too. (Even if there weren't many options) Getting into the game play felt abrupt to me, and that might be why. I'm not sure if you intend to keep building this game, but I think it has a lot of potential if you do. As for the platforms. At the beginning I thought this flat one would suffice as it is "Final Destination like", but now that it works it is clear that more platforms/hazards must be an option as not everybody (almost nobody) is ultra-competitive. I will certainly add different levels in a future version. As a bonus we can use it to have a dedicated stage selection screen which will help with the abrupt start ... Even if I tend to prefer start rapidly the real game instead of multiplying menus. Of course I will! 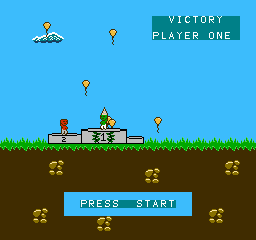 I learned about the nesdev compo after beginning the project and I still enjoy developing it. It can be found on itch.io where I will continue to update it until I am very happy with it and I maintain release notes on smashboards. I am not sure if it is worth opening a new topic on nesdev to keep you updated, possibly with more technical details than on smashboards. Is it a good idea? The changes sound fun - as for the forum thing, I think it's up to you. I haven't really participated in one of these before, so I don't know how long this forum stays active - not like you have to decide right now at any rate. Maybe you'll get a nice long period to work on it and come out with a bunch of new features, and that's the time to move to a new post. Oops, I did not sent the good build last time. Sorry for that. The version shown in the title screen is "NESDEV2016 AI"
I was just testing the latest build of Action 53 v3, and the visual glitchiness is kind bad. Entering the battle options screen will randomly corrupt tiles with a high probability (vblank overflow). Every hit will blink to the other uninitialized nametable, which can be quite ugly depending what the other games might of put there. Make sure that your scroll values also correctly sets the nametable selection bits in PPU_CTRL ($2000), or if you want solid blue blinking just disable background instead via PPU_MASK ($2001). Hey thanks for the pointers, I'll try to find some time to fix that. The blue blinking is not wanted and actually not happen standalone. I was sure that I initialised my two nametables before starting the main game mode. I'll double check that. Do action53 support mirroring or do I have to initialize the four nametables ?